There are plain plasterboard fixings and there are Grip-It® fixings. These ultra strong plasterboard fixings are crafted from a revolutionary design that provides a strong fix when hanging anything that weighs up to 400lbs. Our innovative product that took the UK world by storm is as seen on tv and the winner of the BBC show Dragon’s Den. The patented design is masterfully engineered to provide a safe and secure wall fixings that works 100% of the time so that you can confidently hang your flat screen TVs without the fear of falling down or busting apart. 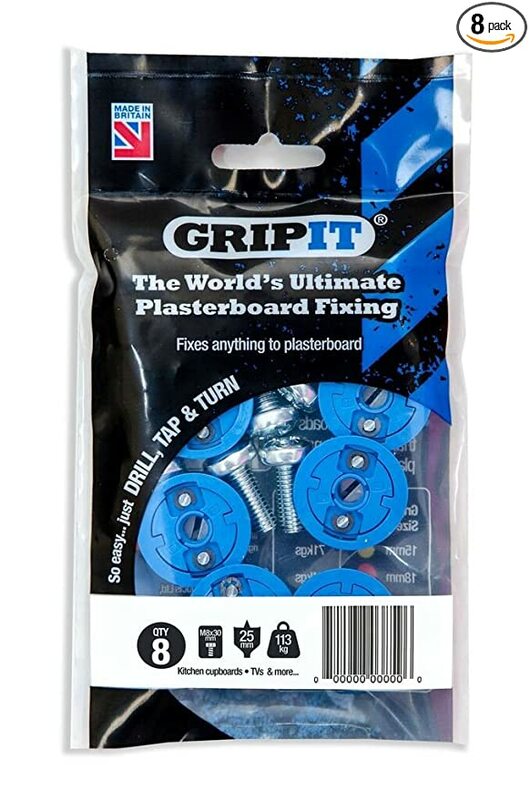 “THE WORLD’S ULTIMATE PLASTERBOARD FIXING” There are plain plasterboard fixings and there are GripIt® fixings. These ultra strong plasterboard fixings are crafted from a revolutionary design that provides a strong fix when hanging anything that weighs up to 400lbs. Our innovative product that took the UK world by storm is as seen on tv and the winner of the show Dragon’s Den. The patented design is masterfully engineered to provide a safe and secure wall fixings that works 100% of the time so that you can confidently hang your flat screen TVs without the fear of falling down or busting apart. It has 3 Unique gripping system that creates a vice- like hold in plasterboard walls. All you need is just a simple DRILL, TAP and TURN for quick installation. Once drilled, the unique backing wings expand inside the cavity to provide a secure anchor, creating a strong tight grip. Cassandra's Review- If you have a drill this is fairly simple to use and you do have to put a hole in the wall you choose to use this with. It is strong for lighter projects. The Marxman Marking tool is a unique deep hole marking tool, enabling you to make a clear reference mark, quickly and easily. Simply push Marxman into a fixing hole and it delivers a burst of bright, fluorescent green pigment onto the mounting surface. The pigment is highly visible non-permanent and clearly shows you exactly where you need to drill. The ease and accuracy, saves you time and frustration every time. The Marxman is particularly useful if fixing at height. You can use one handed, whist holding an item in place with your free hand. It marks through thickness up to 45mm. Each Marxman dispenses 250 doses. Featured on Dragon's Den UK (Shark Tank), this multi award winning, simple solution solves a very common problem, how to get a drilling mark through a deep hole. For instance, you need to fix a thick pre-drilled batten onto a wall, how do you go about marking the holes for the fixings? Do you sharpen your pencil, scratch around for a reach mechanical pencil, or try to find a bradawl or scratch awl with a long enough blade? When you remove the batten and prepare to drill, can you clearly see the marks? Perfect for all DIY projects as well as tradesmen. Cassandra's Review- It works good, can be used with any surface wall so that is a huge plus and it is lightweight. It easily fits in the toolbox.